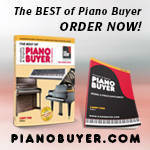 New and Used pianos for sale. Remember to Scroll Down After Submitting Search to See Results! To see all the current ads, simply click Search then scroll down to see the results. 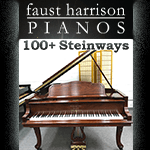 Listings of new and used pianos for sale by individuals, tuners, and dealers. NOTE to Piano Sellers: There are unfortunately many scammers on the Internet. Be particularly wary of anyone offering to buy your piano without seeing and playing it. This is almost always a sure sign of a con job. NOTE to Piano Buyers: While the piano you are interested in does not need to be located near you (there are reputable piano movers who can move it), you should NEVER purchase a piano without seeing and playing it in person! If you would like to contact the seller, you must use the email in the ad or our ad inquiry form. All requests will go through us to help prevent spam and fraud. Getting too few results? Try leaving the State field blank. When searching for a brand that has more than one name (ex: Mason Hamlin) only enter the First Name. So for Mason & Hamlin you would only enter Mason. If you find a good enough deal it may be worth having it moved. You will need to scroll down after clicking the Search button to see the results. To See ALL the Ads, simply click the Search button without filling in anything else. YOU MUST SCROLL DOWN AFTER SUBMITTING SEARCH! – NOTE: Search Results Will Display Below the Search Form!